The MOT test is the annual inspection of your vehicle to ensure it meets minimum road safety standards. By law, all cars which are 3 years old or over must have an MOT test every 12months to ensure your vehicle is roadworthy and in safe working order. 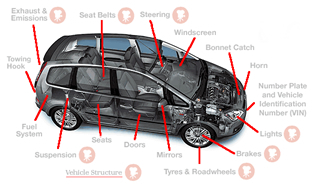 At Andy Turner Motor Engineering we are able to offer class IV and class VII MOT's and if your vehicle should fail we will be happy to explain why and show you the problem areas. Furthermore if your vehicle has failed its MOT we are able to repair your vehicle back to MOT standard. Call 0113 2784003 or email info@andyturnermotorengineering.co.uk to book your next MOT. Unsure if your vehicle is due its MOT? Want to see the previous MOT test results?